It is difficult to describe how exciting it was to visit such an iconic New Orleans restaurant as Brennan's. The restaurant opened in 1946 and was a successful upscale restaurant until 2013, when Brennan family conflicts over ownership resulted in the French Quarter landmark closing. However, restaurateur Ralph Brennan purchased the restaurant and it underwent a $11 million renovation, re-opening in 2014. The eatery has certainly been restored to its former glory - and then some. Brennan's will soon open a wine room to complement its 300-plus dining room seating and dining rooms for private parties. Now to the important part: the delectable food and experience we had at Brennan's. First, the servers, dining room captain and management make you feel like royalty, and take care of your every need. This is definitely the place to go if you want to feel special. sauce was a wonderful complement to the tender sweetbreads. They were one of the best - and most light sweetbreads - we have ever had. The New Orleans BBQ Lobster was also delicious - we have never tried a BBQ sauce like that - but the lobster was slightly overcooked and I would have loved more fresh thyme. For entrees, the Smoked Pepper Seared Tuna was outstanding. We loved the barbecue/ smoky flavor to the tuna, which was the best tuna we tasted while in town. The black-eyed peas served with the dish had a wonderful smoky flavor as well. The Sauteed Flounder with Israeli cous cous was also perfectly prepared and the cous cous was delicious. Now to dessert. Brennan's is the birthplace of Bananas Foster. Literally. Our server explained the history of the dish as he was preparing it table-side. I may have zoned out, as I was too busy drooling over the bananas being carefully heated in a sea of melted butter, brown sugar and banana liqueur to pay attention. Served with vanilla ice cream, this is the most outstanding dessert we have had in quite awhile. Where: 417 Royal St., New Orleans. I HAD to dine at GW Fins in New Orleans. 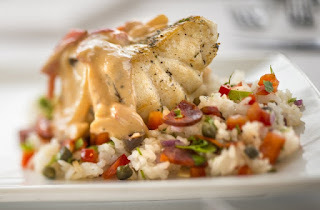 I am a lover of fresh seafood, and knew that the executive chef and owners at GW Fins work directly with fishermen to bring in fresh Gulf seafood daily. The menu, printed daily, features 10 to 15 different fresh seafood items. Plus, my friend told me about their Sizzling Oyster Appetizer, truly a unique dish that combines cold-smoked raw oysters on oyster shells heated to 400 degrees and topped with rock salt. The appetizers we tried were equally as unique and delicious. The Yellowfin Tuna Tartare, which was served with avocado, wasabi and mango, was so delicate. It truly honored the taste and texture of the tuna, without adding strong sauces to mask the flavor. The avocado-wasabi mixture complemented the tuna perfectly. We also highly recommend the Lobster Dumplings, topped with fennel and served atop a lobster butter. The lightness of the dumplings was surprising and we loved their mild flavor. The Firecracker Tuna Tacos with pickled ginger slaw and avocado aioli were very unique, and made for the perfect bite. The fresh fish, mixed with the spicy heat, was a nice surprise, and the aoili was a delicious addition. The Crispy Pork Belly with compressed watermelon and ginger slaw was lighter than expected and the subtle sweetness of the pork belly glaze made it truly unique in a world that loves pork belly. We were even more impressed with our entrees. We had to try the house specialty, the "Scalibut". This one-of-a-kind dish features seared, thinly-sliced scallops, arranged like fish scales, atop a perfectly-cooked, moist halibut. The delicate Pea Shoot Butter is a perfect companion to the fish - and the snow peas. We would highly recommend this dish. The Wasabi Crusted Wahoo, seared rare and served with pickled ginger slaw, sticky rice, bok choy and sweet soy butter was a revelation. First, we have never tried wahoo rare, and now we must have it this way all the time. The ginger slaw sounds simple, but it was complex. It tasted like high-end fried rice and was the perfect companion to the wahoo. We could have licked the plate. The dining experience was second-to-none. The professionally-trained servers are very friendly and take care of your every need. The only caveat: this restaurant is in high demand, even during the week. Open only for dinner, you must make your reservation days or weeks in advance. Where: 808 Bienvelle St., New Orleans. 504-581-3467. 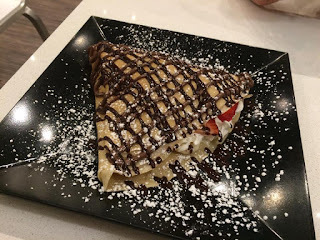 The Crepevine in Altamonte Springs, Fla., is a place where you feel welcome right when you walk in with a friendly staff, a clean look to the restaurant and 90's music playing overhead. And the restaurant stays true to its tagline: fast, fresh, friendly. 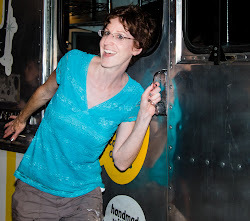 The Crepevine is open from breakfast to dinner, so we tried them for dinner. In a sub-style ordering process, you can pick from one of the crepes suggested on the menu behind the counter or design your own. Every crepe is made fresh to order right in front of you. If you like Caesar salad, the Czar Crepe is the way to go. The ingredients are fresh, the chicken is amazing, and it's ooey gooey yummy with cheese. 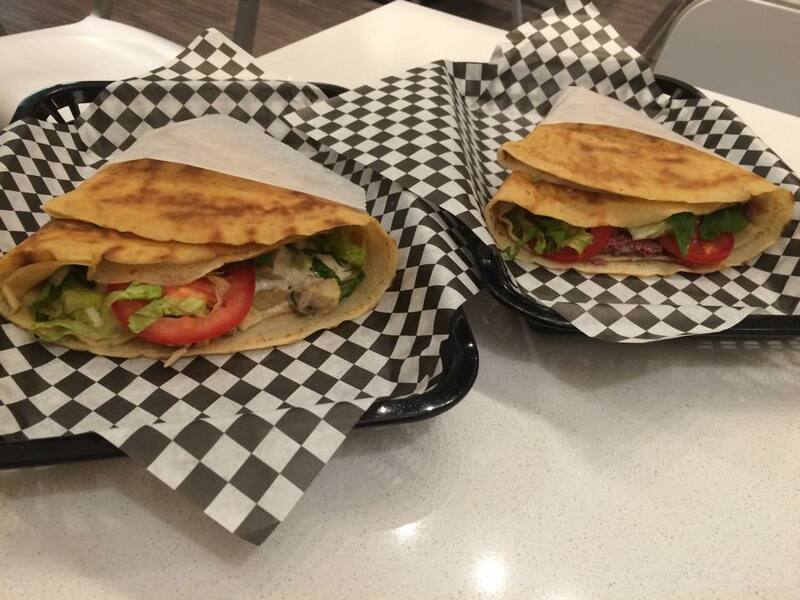 The Shoeless crepe is a mouthwatering assortment of roast beef, ham, bacon, cheese, romaine lettuce, tomatoes, and ranch. They certainly don't skimp on the meat in this crepe. If you still have room for dessert, we recommend the Gilberto. This sinfully delicious, sweet crepe features fresh strawberries, bananas, whipped cream, nutella, and chocolate syrup. You can order it with your savory crepes and they will wait until you are ready for dessert to make it, so it's hot and fresh. It's the perfect dish to share between four people, but they won't judge if you order one just for yourself. 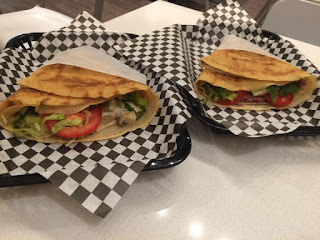 The restaurant focuses mainly on crepes, but they also make excellent fresh salads and have a few other offerings such as Hummus & Carrot Dip, yogurt parfait, and even mimosas. Crepevine just makes you all warm and cozy inside, from their bright smiles to the fancy but heartwarming food. It's the perfect place to end a long day - surrounded by friendly people. 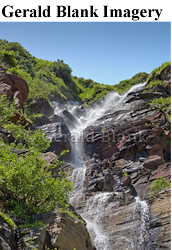 Don't miss any of Flavorful Excursions' reviews. Sign up to receive new Central Florida restaurant reviews in your email inbox, at the top right of this page. As you all know, I could eat breakfast foods for breakfast, lunch and dinner. That is one of the reasons I was happy that Lake Mary has another brunch restaurant that we can enjoy during the week. Peach Valley Cafe has some good dishes, but service is very slow. I am hoping for a different experience at the new Another Broken Egg at 920 International Parkway. My first visit was a preview - the restaurant was not officially open yet - so there were still some service and food kinks to work out. But I love that the dishes we tried were unique to other breakfast/ brunch chains and most were very tasty. I also love the atmosphere of this location - the orange and brown tones are very welcoming and the decor is modern. Everyone - from the manager greeting us at the front door to the servers - were very friendly. 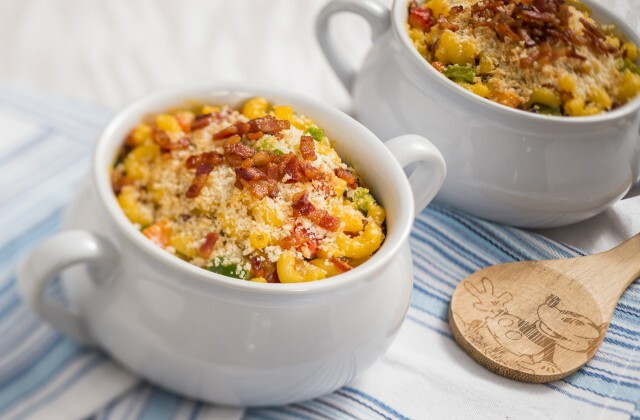 We started with the City Grits, creamy grits with roasted garlic, onions and smoked Gouda, topped with bacon, tomatoes and green onions. This was a different take on grits than we had before, and was very good. Stan's Mardi Gras omelette was also different than anywhere else. It includes yummy andouille sausage, crawfish and shrimp and is topped with a tomato Hollandaise sauce. The omelette itself was yummy - and huge - but I didn't really like the sauce or think it was necessary. I would suggest asking for it on the side, and then just add a bit for flavor. Our pancakes were tasty but a little dense, which may be the restaurant just working out the kinks before opening. All-in-all, I would definitely recommend breakfast or lunch at Another Broken Egg!